If you have built a design model using Model Builder, you MUST set up your cross section plot to extract sections from the model, rather than displaying design sections using your road template. Model Builder is becoming a popular command to easily model islands and other features created using strings. The ‘Add Model/Surface’ option when cross section plotting must be used to extract sections and to specify codes to be plotted. 3) Add the entry ‘ADD MODEL/SURFACE’. You need to specify a model created from Model Builder – the prefix of the model must be ‘BM’. If you select a Civil3D Surface, than you cannot control the codes to be plotted. 4) Use the ‘Set Plot Codes for Models’ option to specify the offsets (codes plotted) on the cross section plot. This is the same as setting Plot Y/N when outputting a template-based section. 5) Specify the ‘Line Layer’ to control how the linework is displayed. 7) Select OK to apply. Users do have the option to specify a sample width for left and right, but this can be left to 0. The software will now extract sections from your model created from Model Builder, rather than displaying the template-based cross sections. It is worth noting that subgrade is not shown when outputting a model-based section. ARD subgrade is calculated from the template. In saying this, there are future plans to be able to create a subbase surface model using Model Builder. View the image below to see a standard entry for the ‘Add Model/Surface’ option. By default, ARD design models and linework will dynamically update as you make changes to your design. For example, when you move an IP in the vertical grading editor, the software will re-calculate all intersections, re-build your model, and re-draw the plan linework. 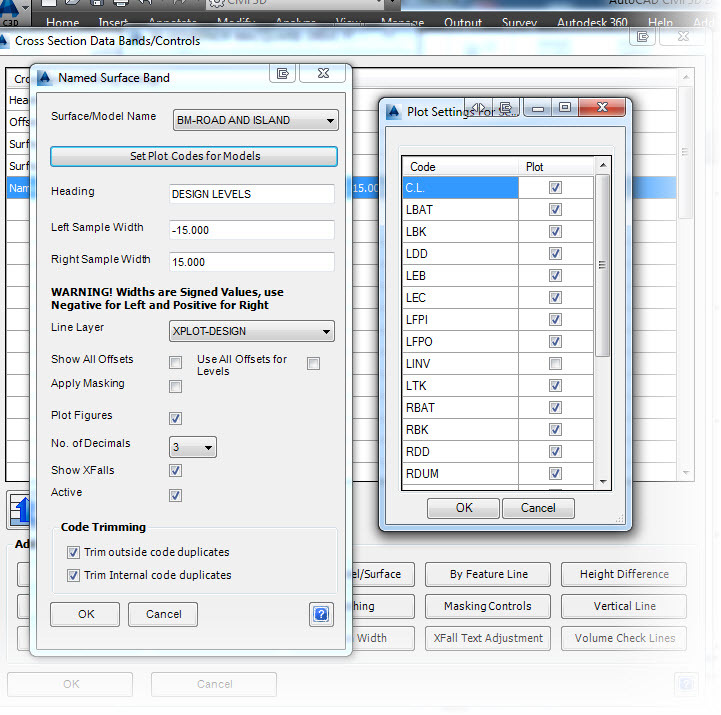 When working on large subdivisions, the re-calculation of your network can become slower. 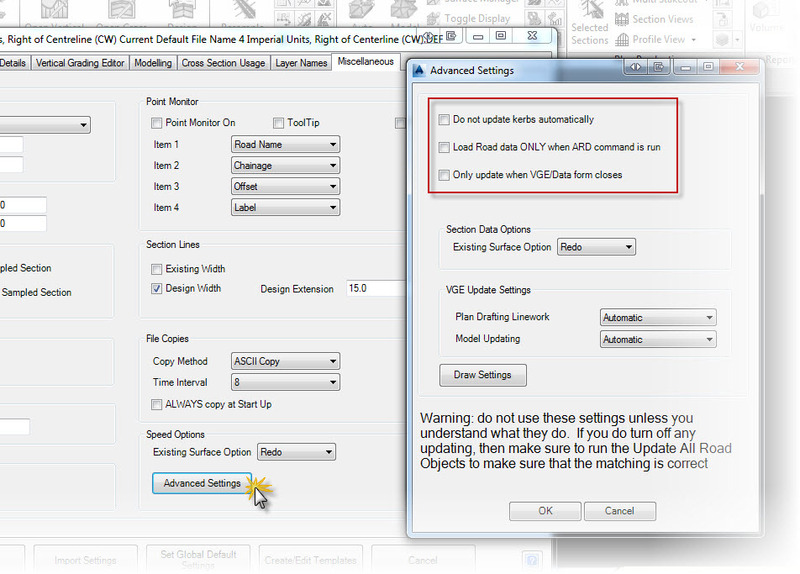 So, in V14 of ARD, we added some options that allow you to tell the software when to update the road data. These options are found in the Active/Global Drawing Settings > Miscellaneous tab > Advanced Settings. 1) ‘Do not update kerbs automatically’ – There are a lot of calculations involved in processing all the intersections. Users can speed up their project by turning this feature on. When the designer outputs a design model or updates the road network, a dialog is displayed that asks the users whether or not they would like to re-calculate the intersections. 2) Load road data only when an ARD command is run’ – When you first load a DWG file, ARD will automatically load all the road data. If you don’t want this to happen, than you can turn this option on. ARD will only load in the road data when an ARD command is run. 3) ‘Only update when VGE/Data form closes’ – As mentioned above, ARD will update all features even when a single IP is adjusted. If the user turns this command on, than ARD will only update your design when the Vertical Grading Editor or Design Data Form is closed. In Advanced Road Design V14, we introduced a Drape Strings command for you to quickly convert your alignments into Strings, complete with an assigned template (if desired) and draped onto a surface. We support updating of all draped profiles from the Updated Draped Strings command. Speed up creating design components that need to be draped on a surface. This video shows how to transfer drainage design data from ARD Pipes into Watercom Drains and back again. Conversion files are also discussed. In ARD V14.03 (V14.03.1 for AutoCAD/BricsCAD users) we’ve enhanced the service obstruction network creation. All you need are layers defining your different obstruction networks (either 2D or 3D) and we’ll turn them all into networks at the click of a button. We’ve also enhanced your options for setting the levels along the pipe – use covers at the start/end, drape the pipe at a constant cover along the pipes, or use the 3D geometry from the polyline. In Advanced Road Design V14, users now have the option to directly output to a Civil3D Surface rather than using the ARD Quick Surface. This surface will dynamically update as changes are made to the design. One of the benefits is that you can apply Civil3D labelling or analysis to the surface, which will update whilst you work on your design. This setting can be turned on in your Active/Global Settings.